I have sold a property at 309 265 15TH AVE E in Vancouver. SOMA DISTRICT! Live and play in the Heart of Main Street in this bright, one bedroom, one bathroom, top floor apartment. There is a walk through kitchen, a separate dining area and in-suite storage that could be a great office. A large South facing balcony, gas fireplace and a functional layout with big square rooms. Located on a quiet, tree lined street across from Tea Swamp Park you can walk to all that the area has to offer. Shopping, restaurants, coffee, parks and easy access to downtown. One parking, an additional storage locker and bike parking. In a well maintained building with updated plumbing and hallways. Heat and hot water are included in your maintenance. Sorry no pets and rentals maxed. YOU’LL LOVE IT! I have sold a property at 504 1111 HARO ST in Vancouver. Welcome to this spacious 2 bed/2 bath + den home situated in the heart of the vibrant West End, Vancouver. This beautifully renovated corner unit features an open concept kit w/ new cabs, quartz counter tops, S/S appls, tile & lighting. The large living & dining areas will accommodate home sized furniture so you can relax in front of the F/P & enjoy gorgeous city views. The extra-large mstr bdrm w/ renovated ensuite bath fits king sized furniture w/ room to spare. Other updates include new solar shades, all bath & kit plumbing redone, heating in the large den. Proactive concrete bldg w/ new piping, updated gym, 2 party rms open to a crtyrd, sauna, bike & theatre rms. 1 prkg & 1 strge. Incredible location steps to Robson St restaurants, shops, Nelson dog park & 10 min walk to the beach! showing and offers anytime. I have listed a new property at 309 265 15TH AVE E in Vancouver. Please visit our Open House at 309 265 15TH AVE E in Vancouver. I have sold a property at 3711 24TH AVE W in Vancouver. VIEW! VIEW! VIEW. City Skyline, Water, and Mountain views from this great property at the crest of the hill. West of Dunbar on a quiet, tree lined street. Views from the back of the house looking out to Downtown and Vancouver's spectacular natural scenery. The current West Coast Contemporary house is oversized and in great condition. There is a two car garage with massive deck above. Renovate and take advantage of the big square footage, hold for rental or build your dream home in this wonderful family community. Close to great private and public schools. In the Lord Kitchener Elementary and Byng High School catchments. Shop on Dunbar, watch a ball game at the park, walk or bike through Pacific Spirit Park and enjoy the lifestyle Dunbar is famous for. YOU'LL LOVE IT! VANCOUVER, BC – July 5, 2016 – Home buyers continue to compete for homes listed for sale across the Metro Vancouver housing market. Residential property sales in the region totalled 4,400 in June 2016, an increase of 0.6 percent from the 4,375 sales recorded in June 2015 and a decrease of 7.7 percent compared to May 2016 when 4,769 homes sold. New listings for detached, attached and apartment properties in Metro Vancouver totalled 5,875 in June 2016. This represents an increase of 1.2 percent compared to the 5,803 units listed in June 2015 and a 6.6 percent decrease compared to May 2016 when 6,289 properties were listed. The total number of properties currently listed for sale on the MLS® system in Metro Vancouver is 7,812, a 35.9 percent decline compared to June 2015 (12,181) and a 1.1 percent increase compared to May 2016 (7,726). The sales-to-active listings ratio for June 2016 is 56.3 percent. While clearly indicative of a seller’s market, this is the lowest this measure has been since February. Generally, analysts say that downward pressure on home prices occurs when the ratio dips below the 12 percent mark, while home prices often experience upward pressure when it reaches the 20 to 22 percent range in a particular community for a sustained period of time. The MLS® Home Price Index composite benchmark price for all residential properties in Metro Vancouver is currently $917,800. This represents a 32.1 percent increase compared to June 2015. Sales of detached properties in June 2016 reached 1,562, a decrease of 18.6 percent from the 1,920 detached sales recorded in June 2015. 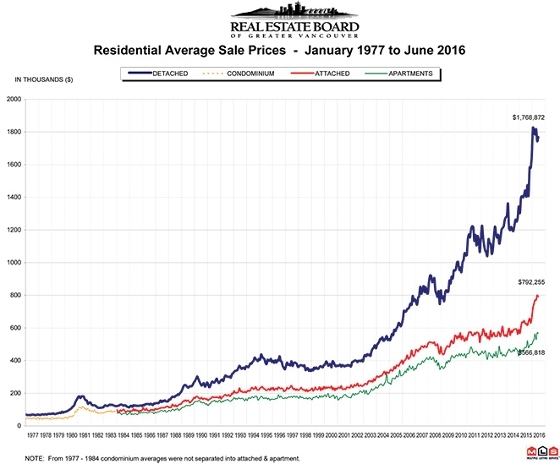 The benchmark price for detached properties increased 38.7 percent from June 2015 to $1,561,500. Sales of apartment properties reached 2,108 in June 2016, an increase of 18.8 percent compared to the 1,774 sales in June 2015.The benchmark price of an apartment property increased 25.3 percent from June 2015 to $501,100. Attached property sales in June 2016 totalled 730, an increase of 7.2 percent compared to the 681 sales in June 2015. The benchmark price of an attached unit increased 28.1 percent from June 2015 to $656,900. I have sold a property at 214 2320 40TH AVE W in Vancouver. Manor Gardens. Two bedroom and den could be three bedroom, two bath, large apartment in the heart of Kerrisdale! Private and Quiet with light on three sides. This is an end unit in the building. Updated kitchen and bathrooms, engineered cherry wood floors and gas fireplace. Big wrap around balcony on the South side. Spacious rooms and a great layout. A short walk to restaurants, coffee shops, shopping, transit, community centre and all that you love about the Westside. Storage locker, one parking space and a pet friendly building. The building has a large roof top deck and has been replumbed. YOU'LL LOVE IT! I have listed a new property at 3711 24TH AVE W in Vancouver. Please visit our Open House at 3711 24TH AVE W in Vancouver.